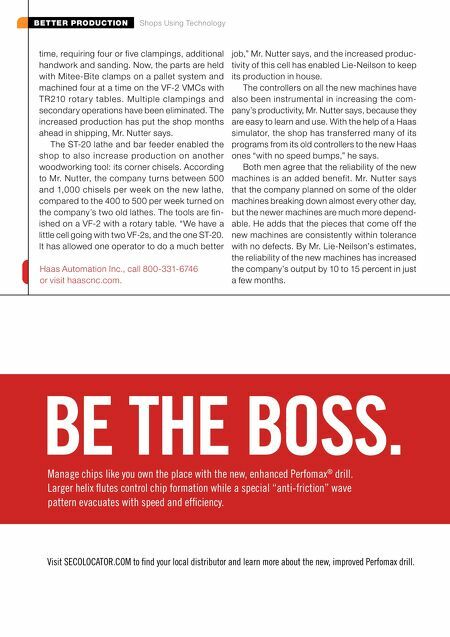 mmsonline.com October 2017 MMS 103 BETTER PRODUCTION Shops Using Technology The company was also able to increase production on its chisels with the help of a new Haas lathe and bar feeder. Once the chisels are turned, they are finished on the Haas VMC with rotary table. This new setup enables one operator to run four machines. The service that Haas and its factory outlet, Tr i d e n t M a c h i n e To o l s, h ave p r ov i d e d a l s o has played a role in the company's succe ss w i th th e n e w m a c h i n e s, i n c l u d i n g e n a b l i n g Lie-Nielson to get its six VMCs up and running in one weekend. 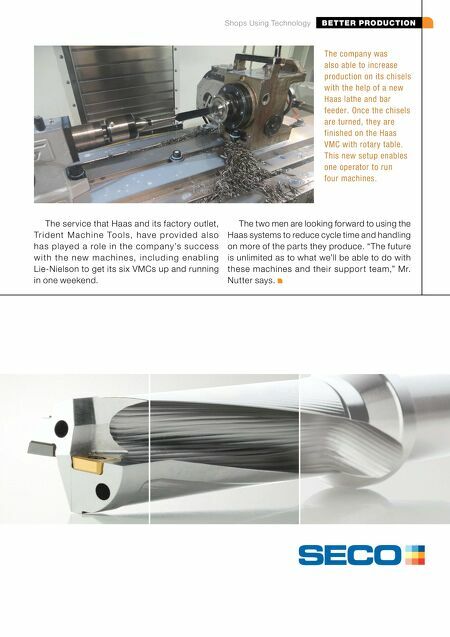 The two men are looking forward to using the Haas systems to reduce cycle time and handling on more of the parts they produce. "The future is unlimited as to what we'll be able to do with these machines and their suppor t team," Mr. Nutter says.